Delaware Amish furniture seekers are in luck, with a sizeable Amish community right outside Dover. Local Amish craftsmen create a variety of pieces for every room in the home. 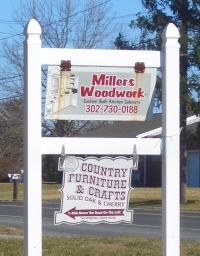 Outside the state capital, residents of other Delaware cities such as Wilmington and Newark have a range of options for Amish furniture as well. Delaware also lies within a short drive of the large Lancaster County community, home to many Amish woodworkers. Amish-made furniture in pine, cherry, and oak; Amish sheds, bedroom furniture, entertainment centers, children’s rockers and more. For Amish furniture listings in Pennsylvania and neighboring states, visit the Amish Furniture Guide main directory. Note to Delaware residents: Please be sure to check opening hours of any Amish furniture businesses listed in this guide before traveling long distances to visit them. While we strive to keep this directory up-to-date, business locations and availability can change. Not responsible for changes to information. The Dover, Delaware area has been home to Amish for nearly 100 years. Traditionally, Amish have made a living by farming, and the Delaware Amish were long the same. However, like in other Amish communities facing population pressure, land prices have made it difficult to farm. Amish in the Dover area compete with land developers and the encroaching capital city. Today, less than 2 dozen Amish remain in full-time farming in the Dover area. Amish in this sole Delaware community have turned to furniture making and other small businesses as a means of economic support. Furniture craftsmanship allows Amish to work together as family, similar to what they maintain on the farm. Amish put manual skills to good use in furniture shops. Amish youth may apprentice with family or furniture-making neighbors from a young age. The average Amish wood worker has many years of experience under his belt, often starting from the teens. Amish furniture appeals to a wide range of buyers, in part due to the many styles and varieties available–not only traditional styles such as Mission or Shaker furniture, but modern designs as well. Add to the mix the many solid hard woods Amish use, such as oak, walnut, cherry, and maple, as well as the wide range of finishes available, and the variations of Amish furniture are nearly limitless. Amish craftsmen typically do custom work on demand, and are able to adapt bedroom, dining room, living room, and children’s furniture, as well as cabinets and other home furnishings, to a client’s individual needs. The Dover DE community is one of a few East Coast Amish settlements facing high population pressures (others would include Lancaster County, PA, and St. Mary’s County, MD). In addition to opening wood working shops and other businesses, some Amish have responded by leaving for other communities in states like Virginia and Kentucky. However a good number of Delaware Amish furniture producers continue to operate at Dover. With a sizeable population remaining, Delaware is likely to keep a contingent of Amish wood workers, providing a source of quality locally-made home furnishings for First State residents for the foreseeable future. Browse a wide selection of Amish furniture online. I reside in Manolia, DE. Our recent move was not too kind to one of our dining room chairs; Ethan Allan solid black birch with cane back. Apparently a leg of one chair penetrated the cane webbing of another and needs to be replaced. I am searching for a craftsman who cn replace the cane and stain it to match the existing color. I do not know what the stain color is, but it is close to Jacobean. The Ethan Allan set is about 40 years old, and in excellent condition. It is our prized piece of furniture and we would like to retain its integrity. I have a small wooden rocking chair which needs the woven seat replaced. I think it is an old splint seat, not caned. I’d like to know if you do this sort of work, and the approximate cost. I am looking for someone to repair a 1903 butter churn. During the years the wood/weather/age has caused all the pieces to come apart. I have numbered all the pieces that have come apart and others that are still attached. Could you please help me with this antique butter churn. I live in Utah and I’m willing to ship the item to your location. Thanks I will await a suggestion of reply. Looking for cabinet builder to add pantry to our existing kitchen. We are building in Smyrna, DE and seeking an Amish craftsman to build closets and custom shelving in two rooms.